In the Ash Wednesday Gospel reading, Jesus says “when you fast, put oil on your head and wash your face, so that your fasting may be seen not by others but by your Father who is in secret; and your Father who sees in secret will reward you” (Matt 6:17-18). Notice that Jesus doesn’t say “If you fast . . .” The implication is that Jesus’ disciples will fast. Aside from teaching his disciples to fast humbly and not call attention to themselves, Jesus does not give explicit instructions about how and when to fast. Even the why seems to be taken for granted in the Gospels. During this season of Lent, as many Christians practice some form of fasting, I think it may be helpful to consider some of the reasons why the Church has practiced fasting over the centuries. We fast to learn self-control. For starters, we do not fast because we’re dualistic, gnostic, platonic, or don’t see value in food. The creation is good, and we honor God’s intentions for the world and our bodies when we nourish our bodies appropriately. But we often are not the best judges of what is appropriate. One of the fruits of the Spirit is “self-control”—the ability to discipline one’s appetites and urges. Fasting helps produce this fruit in our lives. We fast to think more clearly. Perhaps this clarity of mind is why the disciples—“while they were worshiping the Lord and fasting”—heard the Holy Spirit calling them to send out Barnabas and Saul as missionaries in Acts 13:2-3. This means that fasting can be a powerful, but often misunderstood or overlooked element in our processes of discernment. We fast to open ourselves up to God’s power flowing through us. A curious thing happens when Jesus gets caught up in conversation with the Samaritan woman in John 4: He doesn’t get hungry, even though the other disciples are off searching for lunch. Jesus tells his disciples “I have food to eat that you do not know about. . . . My food is to do the will of him who sent me” (vv. 32, 34). Jesus, in his full humanity, practiced fasting as a way to live in the power of the Spirit and do the Father’s will. The inverse of this statement shows us that fasting is not a way to manipulate God. Fasting does not bend our God’s will to match our own. Rather it bends our will to match God’s. And when our will is aligned with God’s, we may discover that power greater than we imagine is at work within us (Eph 3:20). We fast to confess our sin and brokenness. This is most appropriate during the season of Lent, as we practice turning back to God and away from our sinful or selfish desires. Repentance gets short shrift in our proclamation of the Gospel today, but it was integral to the proclamation of Christ and the Apostles (cf. Matt 4:17, Acts 2:38, 2 Cor 7:10). To again quote Richard Foster, “More than any other Discipline, fasting reveals the things that control us.” Fasting reveals the attachments we have to the world and demonstrates our desire to be attached only to Christ. To fast without an element of soul-searching and relinquishment of one’s own will is self-defeating. 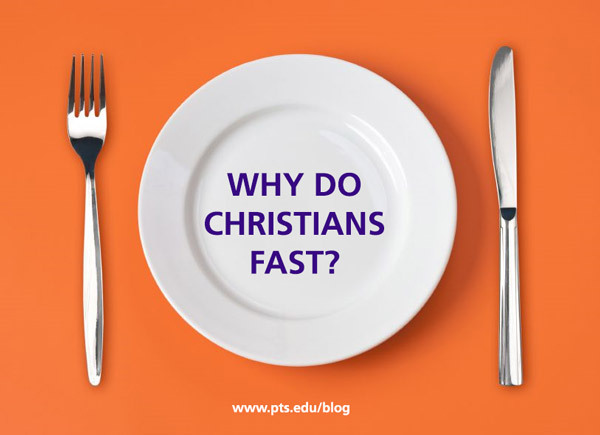 We explore these questions in our next post: How do Christians fast? The Rev. Christopher Brown was the first coordinator of the Church Planting Initiative at Pittsburgh Theological Seminary. He previously served as the organizing co-pastor of The Upper Room Presbyterian Church, a church plant of the PC (U.S.A.) in Pittsburgh’s Squirrel Hill neighborhood. A graduate of Pittsburgh Seminary, Chris regularly blogs at https://christopherbrown.wordpress.com, tweets at @brwnchrstpher, and now lives with his family in Colorado where we serves a church. Thank you so much for sharing all this information! This is exactly what I was looking for.